Born;  5th Oct 1857,   Castlemaine, Victoria, Au. He finally went to Murchison in 1874 where he had two farms one being 500 acres. In 1887 he took over the Commercial hotel. In 1889 when the licence expired he built another one on the opposite corner which he had until 1912 and then went back to the farm. The photo in airman's gear was the first plane to land at Murchison which landed on his farm, I haven't heard the connection with mail delivery before. I would appreciate a copy of the photograph as the one I have is of him standing in front of the plane I also have quite a few other photos of him including a portrait shot, house on farm hotels etc I also have a photo of Sir John Downie taken in NZ on a visit he is apparently a cousin and was either minister of mines in Rhodesia or the British High Commissioner there. Mr Charles Downie, senr., better known as Murchison's " Grand Old Man, " and affectionately regarded as the " Father of Murchison, " celebrated his 90th birthday yesterday, when he was the recipient of multitudinous messages from his host of friends and acquaintances. It is not by reason of his 58 years residence in the Murchison district that Mr Downie is entitled to his affectionate appellation... Infinitely more so is it due to the fatherly interest he has ever maintained in it's welfare. Right from the time of his arrival in the district in the year 1875, but was particularly from 1879 when he took up residence in Murchison township ( then called " Hampden " ), he had the future and prosperity of the district at heart and in no uncertain measure contributed towards it's advancement. This he did by his unbounded enthusiasm and willingness to co-operate with any movement that showed promise of being helpful or beneficial. He did not wait for the lead of others, however, oft accepting the initiative himself. Despite his advanced years, our highly esteemed octagenarian, while naturally not taking the same participation in the affairs of the district, still follows them with as keen an interest as ever and any movement which has a beneficial tendency is accorded his whole hearted support. Mr Downie is truly a member of that " Grand Old Band of Pioneers " who accepted hazardous tasks daily with unconcern. Their life was hard ---- their battle a valiant one against almost insurmountable obstacles. Yet by their grim determination they won through. New Zealand honours and reveres these sturdy pioneers who laid the foundations of our glorious country and to Mr Downie, as a member of that magnificent band of men who helped establish this district and assist towards it's advancement, Murchison pays due homage. Mr Downie has retained his faculties to a wonderful degree and even now recalls vividly happenings of his boyhood in Scotland. His hearing is slightly impaired but, with the aid of glasses, he can read without difficulty. He is also particularly active, as was clearly manifested only on Thursday last when he refused any assistance whatever to make an inspection of the Mataki Ridge. Again he is a great walker and makes a daily inspection of his farm on foot. The fourth son of a family of eleven sons and three daughters, Mr Downie was born in Annan, Dumfriesshire, Scotland, in the year 1843. At the age of 19 years he left his home country and set sail from Liverpool in the good ship Great Tasmania to try his fortune in the Colonies. His first attempt was on the Victorian goldfields where he remained until 1866 when the New Zealand, West Coast fields lured him to Hokitika. He remained on the coast until 1868, when, with two fellow Scotsmen, he set out for "fields" afar and pastures new" coming up the coast to Westport.. There Mr Downie was employed by Eugene O'Connor on construction of the South Spit, but the Addison's Flat rush started that year, the gold fever again assailed him, and the first day of the rush saw him on the field, where he worked and later in Charleston. The same year a rumoured " strike " in Queensland enticed him back to Australia but this not coming up to expectations, a few months later saw him once again on the West Coast at Hokitika. In 1870 he came to Newton, via the Imingaham Valley where he worked of and on mining and road contracting later returning to the Coast. His next step closer to Murchison was made in 1874, when the opportunity was afforded him of becoming associated with his late brother Mr John Downie, and late brother-in-law, Mr William Goodyer, in road contracts between the Lyell and Fern Flat. This occupied his attention with the exception of a short mining exploitation in the Glengarry Valley until 1879, when he took up residence in Murchison. From then until 1887 he was occupied with road and pit-sawing contracts, when he took over Rait's Commercial Hotel ( formally held by George Moonlight ). He held the licence of this hotel until it expired in 1889, when he built a new hotel on the opposite corner, on a site now occupied by the Hampden Hotel. This he held until 1912, when he decided to farm the land in the Six Mile which he had previously purchased. The farm is still held by him and worked under his supervision. In 1871 Mr Downie married Miss Sarah Goodyer, of Ross who died in 1926; The late Mrs J. L. Dixon and Mrs W. Grainger where daughters of Mr Downie and the late Mrs Downie. Surviving members of the family are John, William and Charles Downie, Mrs H. J. Hodgson, Nelson; Mrs C. Lynch, Murchison; Mrs R. F. Byiers, Nelson; Mrs Jaminson, Pakakariki; Mrs A. Thomson, Nelson; Mrs A. Bartlett, Murchison; and Mrs R. H. Betts, Westport, and all were in Murchison yesterday to celebrate, the auspicious occasion with their father. The community was painfully shocked on Monday last when the sad intelligence was circulated that one of Murchison's most respected, revered and esteemed citizen, in the person of Mrs C. Downie, Snr., had passed away in Nelson. Although the deceased lady had not been enjoying the best of late, it was generally anticipated that the change would prove beneficial, and even her most intimate companions and friends, had no idea that the end was in view, consequentially the blow was a sudden and severe loss in the family, while the news caused the whole district to be shrouded in gloom. The late Mrs Downie was born in Castlemaine, Victoria in 1858 and in 1863 came to New Zealand with her parents, the late Mr and Mrs Goodyer, the family settling in Otago following the gold rushes at Weatherstone's and Gabriel's Gully. A few years later, when gold was discovered on the West Coast, the Goodyer family followed the call of the yellow mineral, taking up their residence in Stafford town, where Miss Sarah Goodyer met Mr Charles Downie, who was destined later to become her life partner. 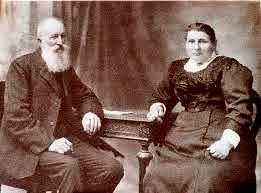 They were married in Ross and Mr Downie continued to follow the gold rushes, through the Butler and Lyell and finally settled in Murchison. It is just on fifty years since Mr and Mrs Downie came to this settlement which in those days, was nothing but massive bush and here the deceased lady nobly entered into the spirit of pioneering and cheerfully assisted her husband to carve out a home. these where the days of hardships, privations and hard toil, but Mrs Downie, like others of that memorable time, was endowed with courage, determination and perseverance and stuck to the task of assisting Mr Downie in " Blazing the trail " half a century ago. Mrs Downie was one of the very few women who fought their way through the dense forests that marked the site where Murchison now stands and resides in the old camp near the Metiki and Butler river junction that was washed away by the Old Man Flood. Here Mrs Downie reared a large family, three sons and nine daughters, all of whom are alive today, testifying to true grit and loving motherly care bestowed upon them by a tender parent. Somewhere in the vicinity of the eighties, Mr and Mrs Downie took over the control of the Rait's Commercial Hotel and ten years later built a large and commodious hostelry, which still bears the name of Downie's Hotel, Twelve years ago they retired from the business and took up a quantity of land on the road to Six Mile and here again the pioneers were faced with the necessity of tackling the forest to carve a home, and the indomitably spirit of pluck and energy was just as prominent with Mr and Mrs Downie as in the earlier days and the beautiful home and property now standing on the site is a testament in their imagination and ability. The late Mrs Downie possessed a kindly hospitable and charitable disposition that readily won for her love and affection of all those whom she came in contact. Her word was her bond and she was never known to be unkind or uncharitable towards her fellow creatures. The deceased lady was all the time ready and willing to lend a helping hand in times of misfortune and was truly in a great many instances a friend in need. Quiet, unassuming, always thoughtful for others, Mrs Downie was beloved by the whole community, which today mourns with the deepest sincerity with the bereaved relatives. To the surviving husband the populous extends it's heartfelt sympathy in the irreconcilable loss of a lifelong loving partner and to the family on the separation from an affectionate mother and grandmother. Murchison today painfully and sympathetically mourns the loss of one of their band of characters, the pioneer woman and mother. You with the love within your heart,,br> You with God's own glory in your eyes." The death occurred early this morning at Murchison of Mr Charles Downie, senr, at the age of 90 years. The late Mr Downie was a native of Eaglesfield, Scotland, and was one of Murchison's most highly respected residents, being known as the "Father of Murchison." Right from the time of his arrival in the district in the year 1879, when he took up residence in Murchison township ( Then called "Hampden," the late Mr Downie had the future and prosperity of the district at heart, and in large measure contributed towards it's achievements. This he did by his unbounded enthusiasm and willingness to co-operate with any movement which showed promise of being helpful or beneficial. He did not wait for the lead of others, however, often accepting the initiative himself. The fourth son of a family of eleven sons and three daughters, Mr Downie was born at Heathery Ha' , Eaglesfield, Scotland, in the year 1843. He was the son of the late Mr and Mrs John Downie, Eaglesfield. At the age of 19 years he left his home country and set sail from Liverpool in the ship "Great Tasmania" to try his fortune in the Colonies. His first attempt was on the Victorian goldfields where he remained until 1866 when the New Zealand, West Coast fields lured him to Hokitika. He remained on the coast until 1868, when, with two fellow Scotsmen, he set out for " fields afar and pastures new " coming up the coast to Westport. The same year a rumoured "strike" in Queensland enticed him back to Australia but this not coming up to expectations, a few months later saw him once again on the West Coast at Hokitika. In 1870 he came to Newton, via Imingaham Valley where he worked of and on mining and road contracting later returning to the Coast. His next step closer to Murchison was made in 1874, when the opportunity was afforded him of becoming associated with his late brother Mr John Downie, and late brother-in-law, Mr William Goodyer, in road contracts between the Lyell and Fern Flat. This occupied his attention with the exception of a short mining exploitation in the Glengarry Valley until 1879, when he took up residence in Murchison. From then until 1887 he was occupied with road and pit-sawing contracts, when he took over Rait's Commercial Hotel ( formally held by George Moonlight). He held the licence of this hotel until it expired in 1889, when he built a new hotel on the opposite corner, on a site now occupied by the Hampden Hotel. This he held until 1912, when he decided to farm the land in the Six Mile which he had previously purchased. In 1871 Mr Downie married Miss Sarah Goodyer, of Ross who died in 1926; The late Mrs J. L. Dixon and Mrs W. Grainger where daughters of Mr Downie and the late Mrs Downie. 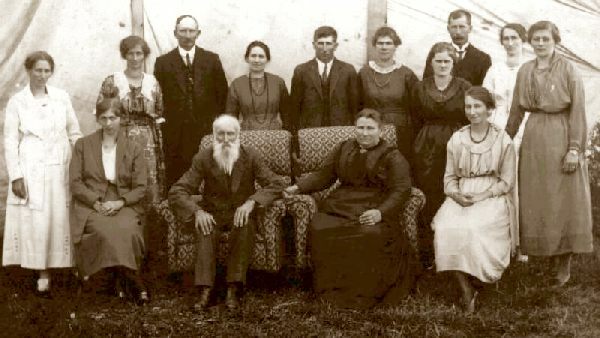 Surviving members of the family are :--- Messrs John ( Murchison), William ( Foxhill) and Charles Downie ( Murchison ), Mrs J. Hodgson, (Nelson ); Mrs C. Lynch, ( Murchison ); Mrs B.F. Spiers ( Murchison ); Mrs H. Jaminson ( Packakariki ); Mrs A. Thomson ( Nelson ); Mrs A. Bartlett, ( Murchison); and Mrs R.H. Betts, ( Westport ). There are 35 grandchildren and 8 great grandchildren. Charles Downie was known as "Murchison's "grand old man" and regarded by the community as the father of Murchison. When he died aged 96 on September 7, 1939, a link with the early pioneering history of the district went with him. Charles Downie was born in Scotland in 1843, the fourth son of a family of 11 sons and three daughters. He was 19 when he sailed for Australia to try his luck on the Victorian Goldfields where he stayed until 1866. In 1870 he moved to Newton where he worked mining and road contracting, later returning to the coast where he married Sarah Goodyer in Ross. There he continued with roading and pit sawing contracts until he took over Raits Commercial Hotel. The licence for that expired in 1889 and he took the opportunity to build a new hotel on the opposite corner which he ran until 1912. The Downie's next move was to farm land in the six mile valley which they had purchased some time earlier. They had a family of 3 sons and 9 daughters. Sarah Downie died on November 30 1924 aged 66. She was born in Castlemaine, Victoria, in 1858 and had come to NewZealand with her parents in 1863 settling in Otago following gold rushes in the area. A few years later when gold was discovered on the West Coast the Goodyer family moved there living in Stafford Town where she met Charles Downie.